Wednesday 24th. September, 2014 – Working Away! This afternoon I had to drive nine miles south of our home to the picturesque village of Coldstream to attend a meeting. I parked in a little off-road car park, from which this was the view. Special, isn’t it? The day started badly, at seven-thirty with Gavinton Church relying on our organ to supply the music, our electronic organ had totally given up the ghost. What to do? After a lot of experimenting I managed to email the music files to my i-pad, purchase an app to enable me to play them on the i-pad and then connect the i-pad to the speaker from the bass guitar in the summer house. It wasn’t perfect, not least because the slightest variation in volume seemed to be magnified a hundred-fold by the speaker. Up in church we got the system set up and as the service progressed I thought that it wasn’t that bad – a bit fuzzier than the organ but certainly better than it might have been. Then we had our ‘disaster’. It came with I, the Lord of sea and sky. If you know the modern hymn you’ll know that it is one of those pieces which has accompaniment between lines and doesn’t just go note by note through the singing. Unfortunately the first two lines are, as with many hymns, the same. Rachel had provided both as an introduction, but the congregation started singing after just the first line. Now a real live organist would have been able to adapt, but not one who is playing something which has been pre-recorded. So we got in a bit of a muddle as you may imagine. Still, it would have happened just as much if we had had the organ. The lesson has been learned that with a hymn like that, one has to provide just a single line introduction and then sing loudly to ensure that everyone has got started! The service was an interesting one with a speaker from the board of the Berwickshire Youth Trust who spoke enthusiastically about the work of the Trust’s staff members in local schools and in youth camps. Ann also spoke about Homelessness Sunday and the challenge which homelessness presents both to our country and to our Church. I wasn’t able to stay for coffee today (Mum and Rachel did) but Tom, David and I had to drive to David’s home to transport some furniture into Berwick. That done, Tom dropped me off at Mount Pleasant where I just had time to change before driving off to Coldstream where there was a meeting which I wanted to attend. I enjoy Coldstream. 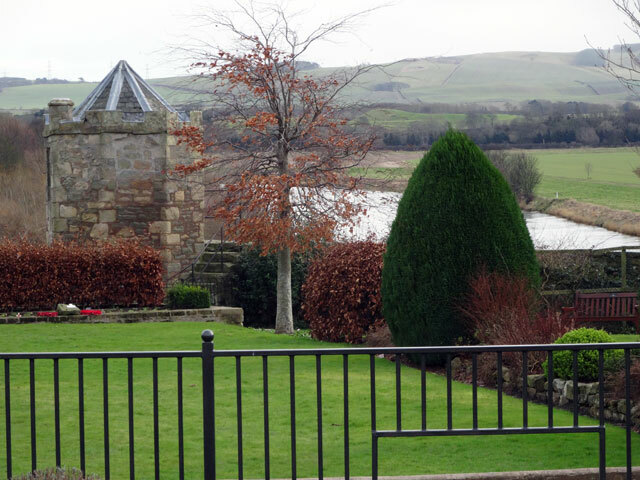 It has character -- and wonderful views of the Tweed and of England beyond. Back home, I enjoyed a late lunch, kept for me by Olive, and soon Rachel was setting off for Berwick where she attended a joint service between her Anglican Church and St. Andrew’s Church of Scotland. She enjoyed it very much. On her return we enjoyed a snack together and watched the start of the new season of Mr. Selfridge – there were shots of the shop windows which reminded me of Rachel and my visit just before Christmas this year, and the lovely windows decorated for the season. I was anxious to get to bed after walking Mix – tomorrow is going to be a busy day.